Jurors know when you judge them. Beware judging | Jon Katz, P.C. Highly-rated Fairfax County/Northern Virginia criminal defense/DWI defense lawyer focused on persuasion at every turn. Since 1991. The Munsters television show transfixed me in my childhood and beyond, right through the evening in the 1990’s that I saw Al Lewis in full grandpa regalia through the front window of his Manhattan nightclub of the same name. One of the best Munsters episodes was when the family’s son, Eddie, transformed from ecstasy over his selection to finally meet his favorite television ghoul Zombo on-screen, to being completely crushed that Zombo was but a creation of makeup artists. Eddie expressed his displeasure by tearing off Zombo’s wig and fake skin and hair on air (minute 2:20). I have had my own disappointing moments with a few celebrities, although not anywhere near Eddie Munster’s with Zombo. The Crusaders, previously known as the Jazz Crusaders, delivered a disappointingly forgettable performance in Los Angeles in 1984 or 1985, to the point that one of the popular musicians they invited on stage did not dignify the invitation with an appearance, or else was not even there when invited. Miles Davis underwhelmed onstage at the 1975 Newport Jazz Festival, when it was still in Newport and before being named after a cigarette. I went to Philadelphia in 2002 to learn wisdom from Bhagavan Das, but he just chanted, though in the process he reminded me of vital lessons. And, https://katzjustice.com/the-inspiration-of-frank-zappa/ merely conducted his band, saying not a word, and playing not a note himself. Dizzy Gillespie challenged my ability to be disappointed or not in someone I was excited to meet. He delivered amazing performances all three times I went to see him, but was not all warm and fuzzy the two times I approached him. He owed nothing to his audiences beyond giving them a good performance for their hard-earned money, and he exceeded that goal by quantum leaps. Celebrities owe no autographs, handshakes, conversation nor acknowledgement when in public on their personal time; in fact, a great way to give thanks to one’s favorite celebrity is to give the celebrity privacy and quiet. Having embraced the concept of non-duality/non-attachment several years ago, I should have already shed expectations of celebrities and others, but easier said than done. I visited Peter Max last September 12 in Tysons Corner, Virginia, and was dazzled over how amazing his original artwork was in real life, considered purchasing one of his lower-priced originals (around $2,500) for my office, saw him walk in and take his place, and then things went downhill, from my perception, but not before my son handed him my own artwork, an origami peace crane. which he accepted and put in his pocket. Soon after I snapped a few of his photos, a gallery staffer announced matter of factly that Peter did not need any photos taken. 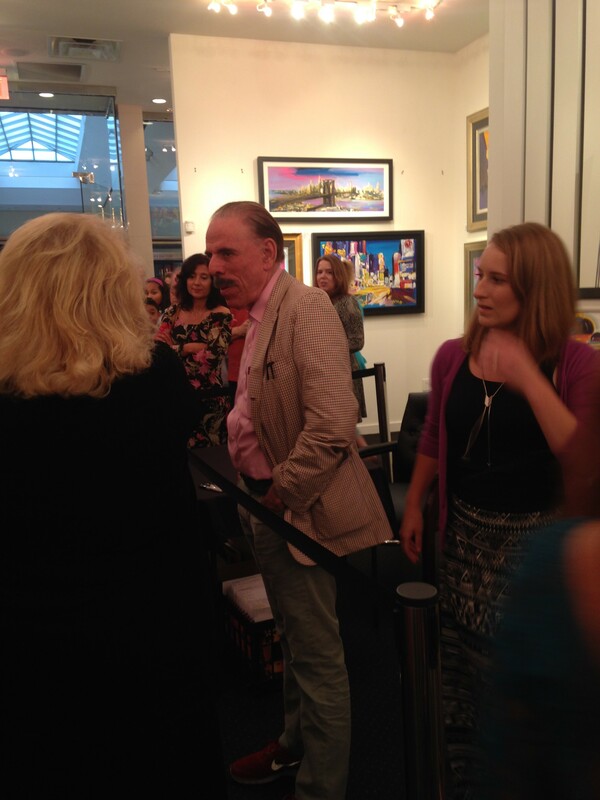 Then Peter merely interacted with those who had purchased his artwork, chatting with them, autographing the back of the framed pieces, and posing for the official photographer. Peter said nothing to the audience other than to those who had purchased his art. I left disappointed at the dichotomy between my high expectations and the reality of the moment. I obsessed on and off into the next day over the event. Of course, I did not expect Peter to criss-cross the nation with appearances for love alone. However, I thought at the time that when such a heavy emphasis is placed on selling, the good energy in the artwork itself diminishes. On reflection, I re-acknowledged that only a vibrant and real soul could have created the works of visual magic that Max has produced over the decades. His story is compelling, starting from fleeing Nazi Germany at two and taking refuge in China during World War II. He was heavily influential on 1960’s art and design, to say the least. He met Swami Satchidananda, who opened the Woodstock festival, in Paris in the 1960’s; illustrated Satchidananda’s Beyond Words; practiced yoga; and contributed to the creation of Yogaville in Buckingham, Virginia. Of course, we all go back and forth from being asleep to awake. While I do my own work to be more awake than asleep, it is not for me to put others down for seeming to be asleep. And how do I necessarily always know when others are asleep in the first place? What energy I wasted obsessing over my disappointment with this Peter Max gallery event. Negative energy snowballs, as does positive energy. I was engaging in negative energy. I am not here to judge. I am here to be, to act, and to serve justice. Statistically, Leibowitz’s jury likely was littered with bigoted jurors. However, could he be sure which ones, if any, were in fact bigots? Won’t a juror know whether I am judging him or her for the look on his or her face or for his or her fashion or lack thereof, grace and demeanor or lack thereof, hairstyle, and any other combination of true, perceived and judged characteristics? My job with potential jurors is to start persuading them early on, and to deselect the potential jurors most likely to harm our case and to be left with a jury that is most likely to help our case. My job with the resulting jury is to accept them as my jury, absent any jury misconduct to discover and report, persuade them, and have the magic mirror take hold. We all are connected. We are all in this life on earth together. How unnecessarily dualistic and energy-draining it is of me to regress into obsessing over apparent low performance by those I look up to and over apparent and actual missteps of judges, jurors, prosecutors, and opposing witnesses. My reality in battle is my reality in battle, with no room for kvetching.